Beginning last Monday, we switched the Sparkle Creations Rubber Stamps Challenge to a bi-weekly schedule. That gives you nearly 2 weeks to play along. We will still post weekly, though, so be sure to visit the SCRS blog for some inspiration and for all of the details. 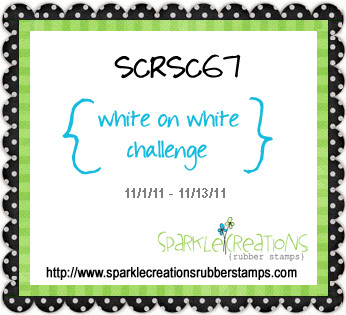 The current challenge (SCRSC67) is white on white. 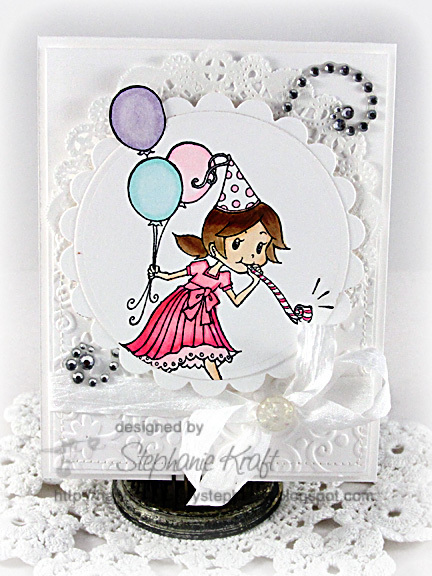 We also welcome a new guest designer for November... the fabulous Jen Shults! This week we are sponsoring Party Time Tuesdays and the challenge is Bling! For all the details on this weeks PTT challenge, please visit their blog HERE. Thanks so much for stopping by! I will be back in a couple of days with our first November preview! Accessories: Standard Circle and Scalloped Circle Nestabilities (Spellbinders); Flower Vine embossing folder (Sizzix), Markers (Copic), Wrinkled ribbon (May Arts), Sparkler (Webster's Pages), Rhinestone flourish, Doily, Foam tape, Thread, Sewing machine. So cute Stephanie! What a sweet card! Love the white scalloped die cut on top of the pretty white lacey doily! Love your take! Such beautiful colors!